Character：C5 petroleum resin is white or pale yellow thermoplastic resin obtained from mainly polymerizing unsaturated aliphatic1,3-Pentadiene (1,3-piperlene) , isoprene and dicyclopentadiene, etc derived from a special process, at a certain temperature and pressure, formed by the polymerization of low molecular weight polymer. As C5 Alicyclic hydrocarbon resins which a kind of sticky resin, CY-ANH-M1100 can be used in high-end rubber, radial tires, bias tires and other rubber mixing. which have an excellent compatibility with a wide variety of elastomers including natural rubber (NR), synthetic rubber, styrene polymers (such as Styrene-Isoprene-Styrene (SIS), Styrene-butadiene-styrene(SBS),Styrene-ethylene-butadiene-styrene(SEBS) and Ethylene Vinyl Acetate (EVA), and also have a good compatibility with the natural tackifying resins (such as terpene resin, rosin and thereof derivatives). 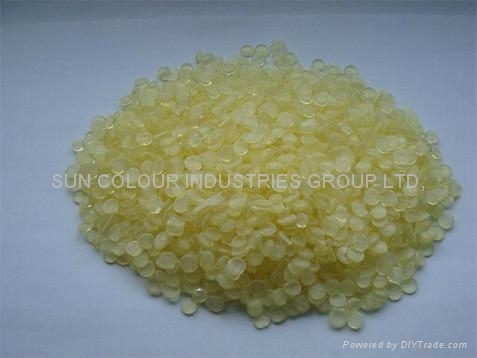 Additionally, the product can be used in rubber compounding as tackifying agent, reinforcement agent, softening agent as well as the filling agent, etc. C5 petroleum resin Color light,, Softening point may be based on user requirements,high-grade rubber in good activity, good compatibility, with excellent viscosity increase, significantly increased between the particles and the particles, particles with wire and connect the bond strength between sub-lines, but does not affect the curing time and physical properties after curing; in the process can play a softening, reinforcing, and improve extension and spalling resistance, help filling material evenly distributed; low hydrogen content tire heat a small, extended service life. Applications: Highend rubber, tire, car tires, bias tires, inner tubes and other rubber compounding industry.